• Grease and flour a 10″ tube pan. • Sprinkle chopped nuts over the bottom of the greased and floured pan. • In a large bowl using an electric mixer, combine cake mix, pudding mix, eggs, water, vegetable oil and rum; beat until thoroughly mixed. • Scrape down the sides and bottom of the bowl with a rubber spatula so the mixture blends well. • Spoon the batter over the nuts and smooth the surface with your spatula. • Bake 1 hour in a preheated 325° oven, or until your cake tester comes out clean when inserted into the center of the cake. • Remove the cake from oven and place pan on a wire cooling rack to cool for 10 or 15 minutes. • In a small heavy saucepan over low heat, melt the butter. • Remove from heat, stir in the rum. • Pour a small amount of the glaze over the cake in the pan. You may have to wait to pour more glaze until the original glaze absorbs. Poking holes in the center of the cake may help with absorption. . Make sure you use all the glaze. • Remove the cake from the pan and place the cake on the wire cooling rack to finish cooling. 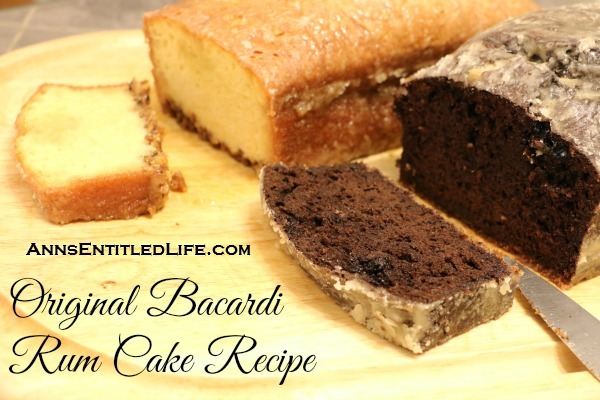 This is the original Bacardi Rum Cake Recipe from the 1980s. 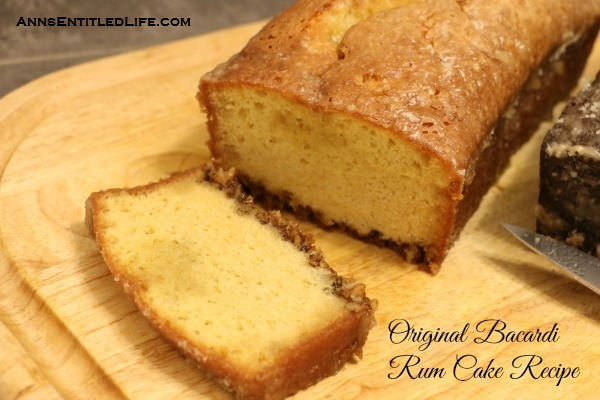 This is one moist and delicious rum cake recipe! Today is Day 5 of 15 Days of Holiday Sweets! 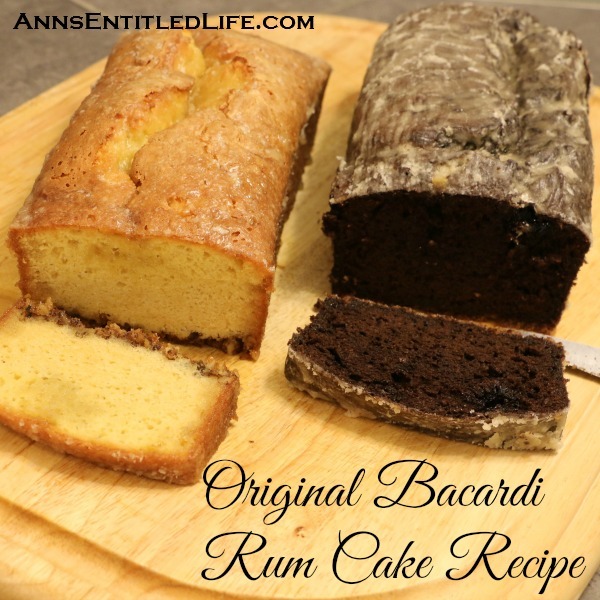 I decided to go with a delicious rum cake, and what better recipe existed than the old Bacardi Rum Cake recipe? This rum cake is fantastic. Make it. You will be glad you did! The original version of the Original Bacardi Rum Cake Recipe calls for yellow cake, walnuts and vanilla pudding. However, you can mix up your nuts, pudding and cake mix for flavor combinations you enjoy! The chocolate rum cake was made with a fudge chocolate cake mix, chopped pecans and instant coconut pudding. I used Duncan Hines cake mix. The yellow rum cake is the original recipe. If you don’t use Bacardi rum, definitely use a dark rum. It makes a world of difference. 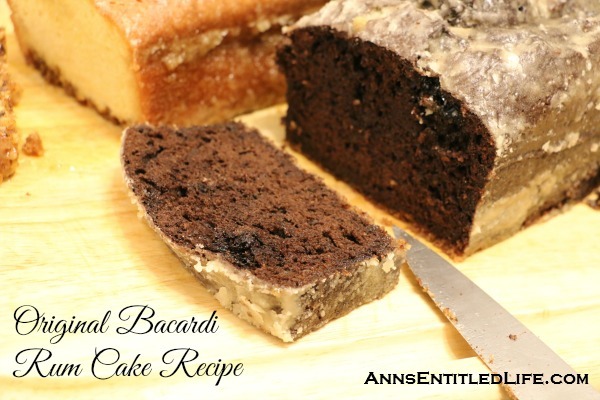 • To print the Original Bacardi Rum Cake Recipe, click here.